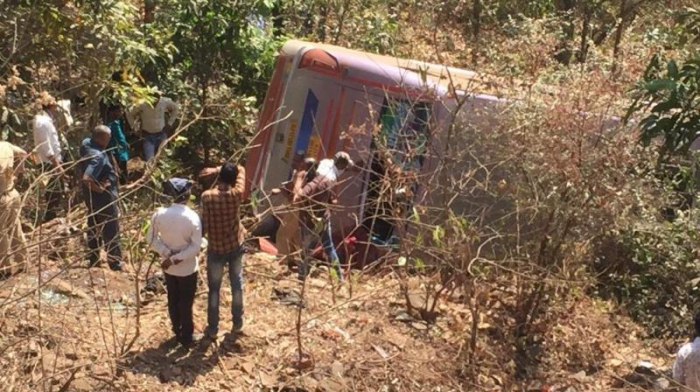 At least six people were killed and 45 others injured, some of them critically, on Sunday after a bus fell into a gorge in western Indian state of Maharashtra, police said, Xinhua reported. The accident took place near Trimbakeshwar in Palghar district, about 171 km north of Mumbai, the capital city of Maharashtra. "This afternoon a bus carrying over 50 passengers fell into gorge at Torangane near Trimbakeshwar. In the mishap four people died on spot and later on two succumbed at the hospital," a police official posted at Palghar said. "Around 45 others injured in the accident are undergoing treatment at a nearest medical facility." Police said they have ordered an investigation into the mishap. Deadly road accidents are common in India mainly due to overloading, bad condition of roads and reckless driving.